We’ve partnered with the New England Seafood Journal to bring you our most recent list that will make any foodie happy! Connecticut is filled with countless seafood restaurants and with so many to choose from it is nearly impossible to narrow the list down to five, however New England Seafood Journal did the best they could (list in no particular order). Here are some of their favorite seafood spots in the Nutmeg state. Situated on the water in Noank, this local favorite serves up a wide-range of seafood meals. Open year round, except for February, Ford's Lobster Restaurant is best known for their Lobster Bomb. 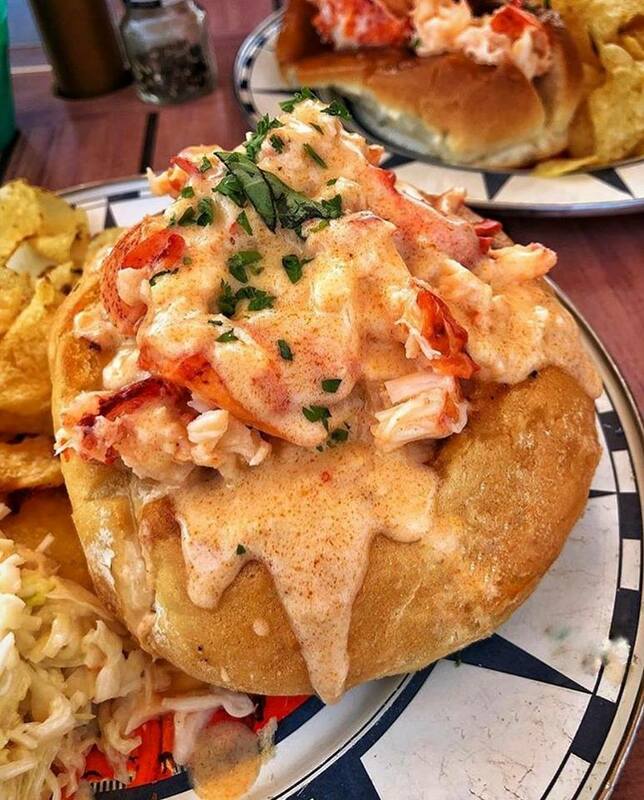 The Lobster Bomb is simply put a massive lobster roll that can be served hot or cold. If only to try the Lobster Bomb, a trip to Ford's Lobster Restaurant is certainly worth the trip. In the state of Connecticut there aren’t many more iconic seafood restaurants than Lenny and Joe’s Fish Tale. With three locations in Madison, New Haven and Westbrook (plus a roving food truck) to choose from most Connecticut residents aren’t far from the wide-ranging menu of fresh seafood and friendly service. Each location offers guests a different dining experience with the same great menu, save a few exceptions. The Madison and New Haven locations offer sit-down dining experiences with the New Haven restaurant boosting large windows that look out into the harbor. Located just 1.3 miles from Hammonasset Beach State Park, the Westbrook location is seasonal offering a relaxing outdoor seating area and also some indoor tables should you choose. Lenny and Joe's Fish Tale boosts a wide-ranging menu that includes lobster dinners, lobster rolls, fried clams, fried soft shell crabs, scallops and nearly any other dish you can imagine. Lobster Landing is simple and delicious. Located on the Clinton shoreline where Commerce Street runs out of pavement, Lobster Landing is the perfect place to enjoy the summer sunshine. With only one seafood item on the menu the choice is simple and the wait is only a matter of moments. The lobster roll is served simply on a perfectly toasted grinder roll with a precisely measured 1/4 pound of fresh hot lobster meat. Each roll includes knuckle, claw and tail meat that has been handpicked and wrapped into small mesh bags. Red 36 in Mystic is the perfect way to end a summer evening. Located along the Mystic River, a short drive or walk from the Mystic River Bridge, Red 36 provides diners with a casual and relaxed experience that is perfect for all ages. When we visited we choose three different meals to try in order to get a full sampling of what Red 36 offers. Our group opted for the Lobster Carbonara served in a parmesan cream sauce with bacon bits and peas, the Clam Roll which was overflowing with lightly battered strips (you can order whole belly clams as well) on a perfectly buttered and toasted brioche bun and the Seafood Paella served on a skillet with a healthy helping of shrimp, clams, mussels, roasted chicken; all of which are served on a bed of saffron risotto, English peas and roasted tomato. Red 36 offers three different menus. During the week they offer lunch, happy hour (4-6) and dinner menus while on the weekend they offer their lunch and dinner options. Located in Guilford, The Place is about as good as it gets. Open weather permitting from around May 1-September and weekends in October, The Place is outdoor seating only with guests sitting on tree stumps while they enjoy their meal. All the food is cooked over a fire-pit with the menu including wood-grilled lobster, clams, shrimp, bluefish, catfish, salmon and also some non-seafood options including chicken and rib-eye steak. Something to note, The Place only accepts cash or check, credits cards aren't accepted. Local Connecticut does not claim ownership to any of the photos used in this article. Respected photographers are listed below each photo(that apply).